I was hooked from the first page of The Blood That Bonds and now I am waiting with utter anticipation for The Children of the Sun to be released. I am attached to these characters and the story. Blood Hunt only made my investment to these amazing characters stronger. This book was a great sequel to TBTB. It answered so many questions that I, personally, needed answered, yet raised more questions that kept me interested and with a desire to know more and keep reading. I felt sad when the characters were sad, angry when they were angry and frightened when they felt frightened. I enjoyed the sarcasm and twisted sense of humor. I do not want to give any spoilers, but simply insist people read this collection of books and hope they feel the same way I did afterwards. I consider myself a picky reader and bore very easy. I can not say how many books I have started and not finished because I was bored to tears and came up with every excuse under the sun to avoid finishing. I also understand that some may judge books by typos, punctuation, spelling, and grammar. To be honest, if I do not like the book and find it difficult to follow I would do the same. Something about this story and these characters drew me in and I could "feel" what they were feeling and that is why I rate this book 5 out of 5 stars! 13 pessoas acharam isso útil. Book 1 was one of those books that you finish at 3 am, immediately turn on your wifi link, and jump to "More By this Author", and hope that Book 2 is out there. I was lucky this time, it was, and I delved into it immediately. Thank you, Christopher, for another sleepless night. We follow on directly in the life of Two, and she is still an intriguing character. This time, she make some choices which we have to question, but this sort of development of a character is exactly what you need within a series, especially a dark one like this. We get to know the surrounding characters much better this time too, and the clever plot is also combined with complicated timelines and multiple person viewpoints. Don't get me wrong, it wasn't confusing to read, but I shudder at the thought of avoiding continuity errors during the writing, hats off to the author. This book also delves deep into the vampire mythology and politics. It answered many question, but raised several of it's own. The third book wasn't available at the time I finished this book, or I am sure it would have been downloaded straight away. Like many others who read The Blood that Bonds, I couldn't wait until Blood Hunt was released. I am very happy to say that Chris made it well worth the wait. It was the perfect sequel. I've made no secret of the fact that I was not happy with where Two and the rest of the characters were left at the end of The Blood that Bonds. I even devoted a Follow Friday post on my blog to my feelings on the subject. I'm not saying that I felt like it should have ended differently. It ended where it needed to end so Two's story could continue. I'm just saying that I wished Two could have been in a better place than she was, only because I felt so bad for her. After reading Blood Hunt, I now feel a lot better about how the first book ended and know now why it had to end the way it did. See, it's always important to trust an author to take care of his characters. 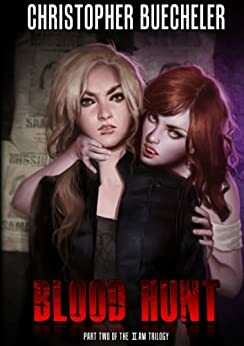 Blood Hunt was longer than The Blood that Bonds, which allowed for a lot more in depth description of vampire history and politics. It also allowed for more character development and the introduction of some more key characters. This brought you a lot closer to the main characters and help you understand a bit more of where they were coming from. Although Two ended in a much better emotional place at the end of Blood Hunt, that doesn't mean that she didn't suffer. Actually, through most of the book she was still suffering, along with most of the other characters. There were some light and happy moments though, just enough to keep the reader from becoming totally bogged down. Several things that Chris did with Blood Hunt kept things interesting. Chapters and sections were written from different characters' perspectives. The book was also broken up into parts, which didn't always follow chronologically. At first this bothered me, but once I started reading and saw how the parts eventually wove together, I realized it was actually a very effective way to approach the scenes. As far as the ending of Blood Hunt as compared to the end of The Blood that Bonds? I'm not going to give anything away except to say that I was so wrapped up in the story, I never saw the twist coming until it happened. It still wasn't a truly happy ending, but Two's story isn't a happy one by any stretch of the imagination. It's dark, sad and full of conflict, but there's still hope. I'll be waiting patiently for the next installment because there are still a lot of lose ends that need to be tied. The Children of the Sun is sure to be another emotional ride for Two and the rest of her friends.